While this may sound like an ordinary therapy session, it was not what you would typically expect. Kirk was experiencing the effects of a 25-mg dose of psilocybin—the active ingredient in psychedelic “magic” mushrooms—which he had ingested as part of a 2015 clinical trial investigating the drug’s therapeutic potential. After his mother died, Kirk says, he fell into a “deep, dark pit of grief.” Despite antidepressants and regular sessions with a therapist, his condition was not improving. “I was stuck in it for years,” he recalls. So when he heard Imperial College London was recruiting participants for an upcoming trial studying the impact of psilocybin on depression, Kirk decided to sign up. The study, led by psychologist and neuroscientist Robin Carhart-Harris as part of the Beckley/Imperial Research Program, enrolled 12 patients with varying stages of treatment-resistant depression. Each participant took part in two guided treatment sessions, first with a low dose (10 mg) of psilocybin in pill form, then a high dose (25 mg) one week later. During each psychedelic session, subjects were closely monitored by at least one psychiatrist and an accompanying counselor or psychologist. “The guides [help] provide a safe space for the patient to have their experience,” Carhart-Harris explains. Experiences like Kirk’s are common among people who have participated in a psychedelic session (or “trip,” as it was allegedly first called by US Army scientists in the 1950s). Reports consistently include feeling intense emotions, having mystical experiences, and entering a dreamlike state. Many also articulate a dissolving sense of a bounded self, coupled with a feeling of increased connectedness with others and the rest of the world. When Carhart-Harris and his team assessed their study’s participants three months after treatment, they found that most of the participants showed reduced depressive symptoms, with 5 of the 12 in complete remission1—including Kirk. It’s now been two years since he received psilocybin therapy, and he says that he has not needed antidepressants or therapy since. “I got a new positivity that I didn’t have for some time,” he says. These results are preliminary—the study tested a small sample size with no control group. But other recent trials, including some that were larger and included controls, have revealed additional therapeutic benefits. Last December, for example, two randomized placebo-controlled clinical trials of psilocybin in terminal cancer patients (51 and 29 patients, respectively) found that giving participants psilocybin in guided sessions could substantially decrease depression and anxiety—an improvement that persisted for at least six months after treatment. 2,3 In smaller pilot studies, psilocybin has also shown success in treating addiction. In two small trials, one involving smokers4 and the other alcoholics,5 most participants remained abstinent for months after treatment with the psychedelic. A number of early studies have also reported evidence that other psychedelics, primarily lysergic acid diethylamide (LSD), have similar effects. 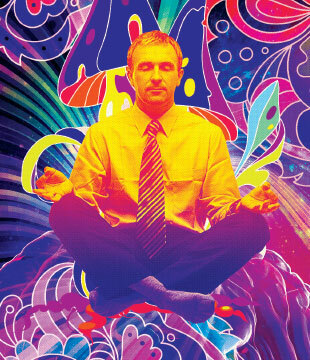 Roland Griffiths, a psychiatry professor at Johns Hopkins University, describes the effects of psychedelics as a sort of “reverse PTSD” (posttraumatic stress disorder). With PTSD, there is “some discrete, traumatic event that produces some alteration in neurology and perception that produces [psychological] dysregulation going forward,” he says. In a similar but opposite way, treatment with hallucinogenic substances is a “discrete event that occurs to which people attribute positive changes that endure into the future.” While scientists are only beginning to understand the mechanisms behind these effects, what they’ve found so far already tells quite a compelling story. 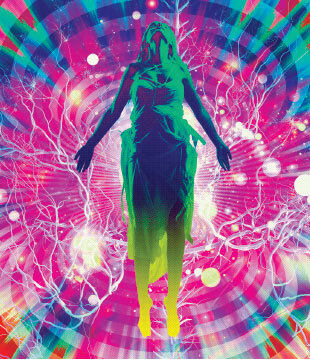 Most psychedelics researchers believe that the session itself—the profound experiences individuals have during a trip—is key to the drugs’ therapeutic effects. But whether this is a cause or consequence of underlying neurobiological effects is still unclear. Studies show that psychedelics disrupt established networks in the brain, potentially allowing new connections to form. 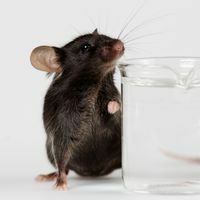 Recent work has also begun to reveal that these drugs’ effects—such as promoting neuroplasticity and reducing inflammation—are exerted through the serotonin 2A receptor. Understanding how hallucinogenic drugs affect different neural networks could shed light on their therapeutic potential. 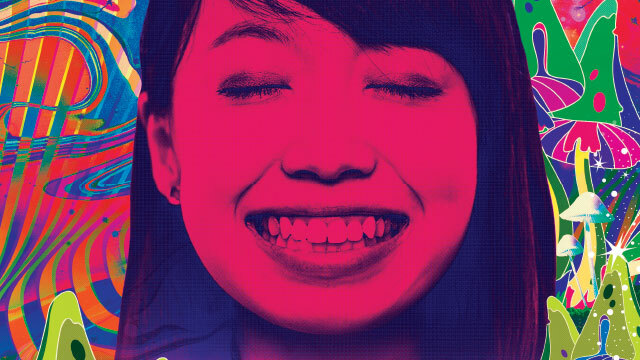 While on psychedelics, people commonly experience ego dissolution, a loss of the sense of a separate self, and an enhanced feeling of connectedness with the outside world. Recent neuroimaging studies have revealed that the intensity of this experience correlates with changes in brain activity, primarily in the default mode network (DMN)—a system of brain regions that is more active at rest than during tasks, and that is thought to be involved in, among other things, processing information related to the self. Researchers have found similar neurological effects during meditation—another altered state of mind associated with psychological well-being. 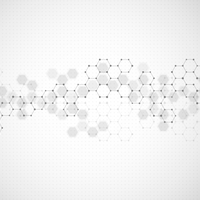 Expert meditators also show an acute reduction in the activity of the default mode network.9 Conversely, an increase in activity and connectivity in this network has been found in some individuals with depression. “In some ways, it kind of makes sense that psilocybin, which brings people very powerfully into the present moment, would be more similar to meditation than it would be to depression,” says Griffiths. “In other words, people are riveted with interest in the present moment and what’s happening here and now, rather than in the future or in the past.” Griffiths and his colleagues at Johns Hopkins are currently conducting a neuroimaging experiment probing the brains of expert meditators on psychedelic trips. 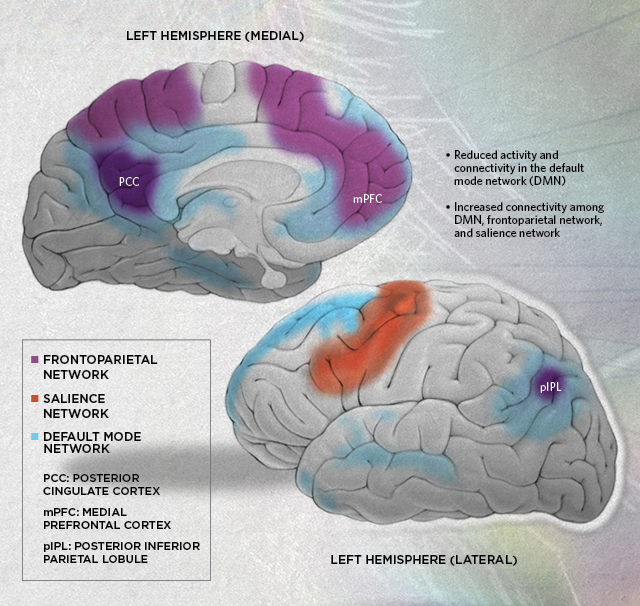 Key brain areas involved in the effects of psychedelic drugs are located in the default mode network (DMN), which is more active at rest than when attention is focused on the external environment. Neuroimaging studies have also shown that connectivity between brain networks is increased when psychedelics are administered. Scientists have discovered that a number of psychedelics can reduce inflammation throughout the body. 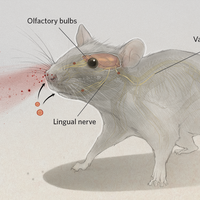 Animal studies with one of these drugs, DOI, which is an especially potent anti-inflammatory compound, are starting to reveal the mechanism behind these effects. According to one hypothesis, DOI binds to and activates the serotonin 2A (5-HT2A) receptor to recruit protein kinase C (PKC). 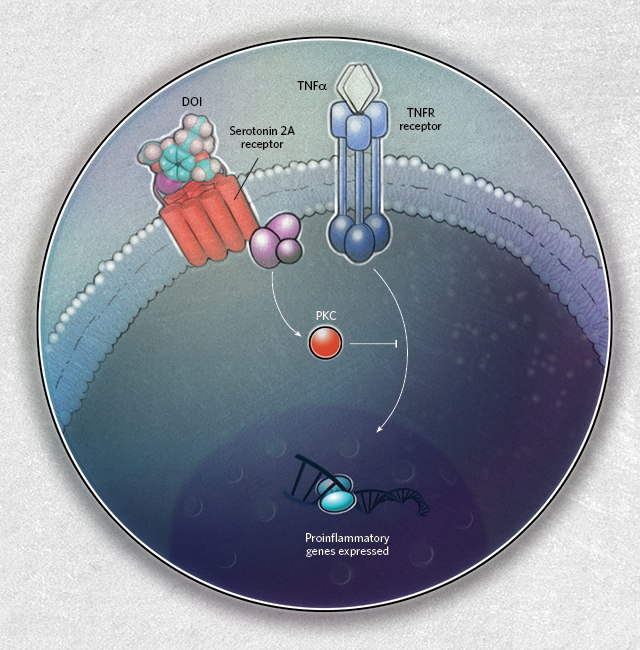 This is thought to block the downstream effects of the binding of tumor necrosis factor-alpha (TNF-α) to its receptor (TNFR), which is known to initiate a signaling cascade that promotes the transcription of proinflammatory genes. © SEAN MCCABEAlthough researchers have only recently started to test psychedelics’ effects in controlled clinical trials, evidence that these drugs could help treat conditions such as depression and terminal cancer–related anxiety has existed since the middle of the 20th century. (See table below.) Despite promising results, the counterculture that emerged around LSD use led to the criminalization of it and other psychedelics in 1966. Since 1970, almost all of these compounds have been Schedule I controlled substances, which imposes strict prohibitions on their use, even in research. Now, psychedelics research is slowly starting to regain ground, though it’s still not easy to win federal funding for these studies. But with support from private organizations such the Heffter Research Institute and the Multidisciplinary Association for Psychedelic Studies (MAPS), scientists have begun to probe the mechanisms underlying the drugs’ psychological effects and the enduring changes they can bring about. The answers to these mysteries may help scientists gain insight into what happens to the brain in disease, and perhaps learn more about the nature of consciousness itself. 1950s to 1970s Unblinded trials suggested that psychedelics such as LSD could reduce anxiety and depression in terminal cancer patients. 2011 A small placebo-controlled trial of 12 subjects with advanced-stage cancer reported that treatment with psilocybin reduced anxiety for up to six months after treatment. 2016 Two larger randomized, placebo-controlled clinical trials, at Johns Hopkins University and New York University (NYU), found that psilocybin can substantially reduce death-related anxiety and depression in terminal cancer patients. 2016 A pilot study at Imperial College London found that psilocybin had antidepressant effects that persisted for more than three months in a subset of participants. 2017 Researchers at the Federal University of Rio Grande do Norte in Brazil published a preprint for their randomized, placebo-controlled trial of ayahuasca for 35 patients with treatment-resistant depression, reporting improved symptoms one week after treatment. 2017 At the University of Zurich, researchers are in the process of developing a double-blind, randomized, placebo-controlled trial of psilocybin as a treatment for major depression that is scheduled to start later this year. Similar plans are currently underway at Imperial College London. 1950s to 1970s Researchers conducted early studies of therapeutic use of LSD for treating alcoholism and heroin addiction, showing that the psychedelic could reduce substance abuse. 2014 A small study of 15 cigarette smokers at Johns Hopkins University found that psilocybin treatment led to an 80 percent abstinence rate at six months. 2015 At New York University, researchers found positive effects in a small study of 10 participants who underwent psilocybin-facilitated treatment for alcohol dependence. 2014 to 2017 Survey studies show that people who have taken psychedelics subsequently choose to abstain from cigarettes, alcohol, and other drug dependencies. 2017 Researchers at both Johns Hopkins and NYU are currently conducting larger, randomized trials with control groups for both smoking and alcohol dependence. 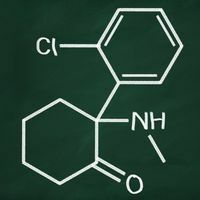 A group at the University of Alabama at Birmingham is currently conducting a pilot trial of psilocybin-assisted treatment for cocaine addiction. 1950s to 1970s Psychiatrists examined LSD treatments for schizophrenia patients. Preliminary studies, many with small sample sizes and no control groups, reported beneficial effects in some children who received this treatment. Around the same time, state-approved tests of psychedelic drugs were also conducted on inmates in the U.S. diagnosed with schizophrenia by doctors who believed in the drugs’ therapeutic potential. 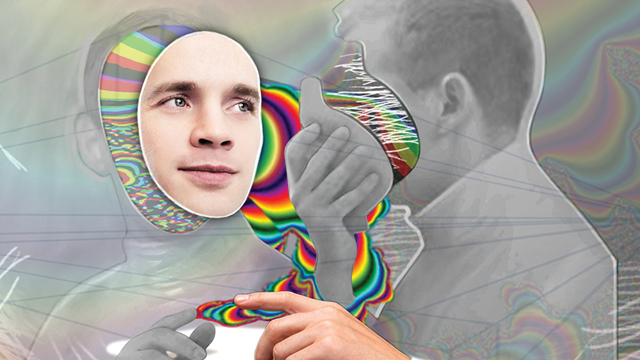 Some psychiatrists also examined the effects of various psychedelic drugs on healthy individuals as a way to elucidate the experiences of patients with schizophrenia and to improve treatment. 1990s to 2000s Recent studies have focused on using these drugs to model psychotic states rather than to treat them. Correction (September 16): In the table, two addiction studies incorrectly listed the years of publication. The study of 15 cigarette smokers was published in 2014; the study of 10 participants who underwent psilocybin-facilitated treatment for alcohol dependence was published in 2015. The Scientist regrets the errors.